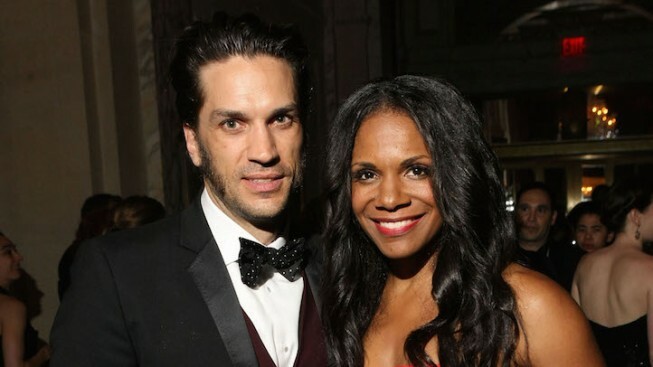 Audra McDonald and Will Swenson at the 2014 Tony Awards. Audra McDonald may not have been Tony-nominated for her role in "Shuffle Along, Or The Making of the Musical Sensation of 1921 and All That Followed," but she's still got a big prize on the way. McDonald announced Tuesday that she's expecting her first child with husband Will Swenson ("Les Miserables"). “Who knew that tap dancing during perimenopause could lead to pregnancy?" she said in a statement. "Will and I are completely surprised -- and elated -- to be expecting a new addition to our family." Unfortunately, McDonald's pregnancy will mean she will have to indefinitely postpone her London run in "Lady Day at Emerson's Bar and Grill." McDonald was previously scheduled to reprise her role as Billie Holiday at the Wyndam Theatre from June 25 through Sept. 3. The good news is McDonald, who was slated to leave "Shuffle Along" on June 20, will now stay with the production through July 24. She'll be replaced by Grammy winning folk artist Rhiannon Giddens, who will make her Broadway debut as Lottie Gee. During McDonald's hiatus, the show's Tony-winning choreographer Savion Glover will step into the musical. Glover's specific role -- and show dates -- have yet to be announced. McDonald will return to "Shuffle Along" this winter. "Shuffle Along" explores the backstory for the 1921 groundbreaking revue of the same name. Nominated for 10 Tony nominations, the show is directed by George C. Wolfe ("Lucky Guy"). The show features Tony nominees Brandon Victor Dixon, Adrienne Warren, Billy Porter and Joshua Henry, as well as 2016 special Tony recipient Brian Stokes Mitchell. McDonald and Swenson married in 2012. She has a daughter and he, two sons -- both from previous marriages. "Lady Day" was also filmed live from Broadway and aired on HBO earlier this year.